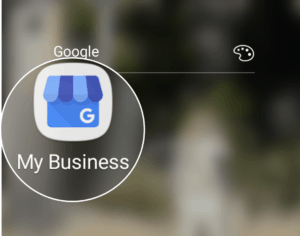 Today, the first and most important place to start improving your local online presence is with your Google My Business (GMB) listing. Without a GMB listing your business will not appear in Google Maps and will be far less likely to show up in Google search results. 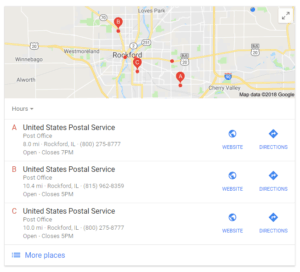 Google Maps search results come from Google My Business listings. If you’re unsure what this is, here are some visuals from local searches for ‘post office’. 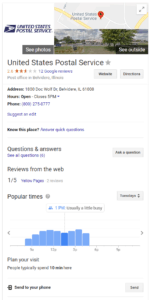 The Google My Business listing is what shows up in (1) the maps area of search results. And the Google My Business listing is also responsible for the (2) knowledge panel of individual locations. We can help you with all four of these steps. But lets briefly discuss why each step is important. Hopefully we’ve already proven why you must have a GMB listing. You can visit Google My Business online to start the process. If there is already a listing for your business on Google, you’ll be notified as you go through the process. But why do you need to claim it as the business owner? The simple answer is without claiming it, you have no access to the content or it’s features. You own your business, and you also need to ‘own’ your GMB listing. You should also have some influence as to what is displayed there. Here’s a link to claim your Google My Business listing. Now, the fun part is optimizing your listing. The goal of this step is to make it more appealing and useful to searchers, thus encouraging more interaction and business. For example, one of the features listed above was photos of your business inside and out. In order for those to be of assistance to people looking for you, the photos must exist and be added to your GMB profile. There are several areas that require your attention, many of which will be subjects of future blog articles on this site. We are here to help you make the best of this powerful tool. Lastly, unlike a phone book listing, you cannot just create it and then never look at it again. Why not? Because the internet is fluid and ever changing, and the listing is designed for consumer interaction. Google encourages users who have been to your location to leave reviews, add their own pictures, pose or answer questions, and even suggest an edit to your information. With all this ability for the public to interact and even influence the look of your listing, you’ll need to review it regularly and make sure the user-generated content reflects a proper image for your business. Although you do not have control over all the content, how you interact or not can influence your online reputation. For example, if you receive a negative review, will you respond in a helpful or a defensive manner or, worse yet, not respond at all? Are questions posed to your business left unanswered, or worse yet, answered incorrectly by the public? Regularly visiting, updating and reviewing your GMB listing ensures the best ongoing results for your business. Another reason to frequently visit your GMB listing is that Google in continually changing it. As mentioned above, some of the more recent features just added during the summer of 2017 are Questions and Answers and Google Posts. In March of 2018 they allowed owners to add a short description of their business. We’ll help you stay up-to-date on new features and advise the best way to use them to your advantage. There is no doubt that paying attention to your GMB listing is imperative. It is a robust tool that can serve your business well. That being said, it is not the only listing you should be concerned with. Although Google is clearly the search engine giant that hold the greatest share of online searches (anywhere from 70-80% depending on the source of the numbers) that still leaves 20-30% of searches being done through others means such at Yahoo and Bing. Bing also has a feature for listing local businesses and it’s important to control that listing as well. Would you like help with any of the steps listed above? Or perhaps this page has raised some questions? 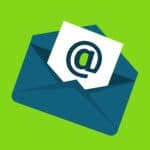 We are here to help with your GMB listing and other listings. Whether it’s creating it, optimizing it, maintaining it, or all the above. Drop us a line for a free consultation.